Over at what Dr. Brooks Simpson calls “the gift that keeps on giving,” a new topic of conversation arose. This time, dialogue centered around the statue of George Washington that stands outside of the South Carolina State House. 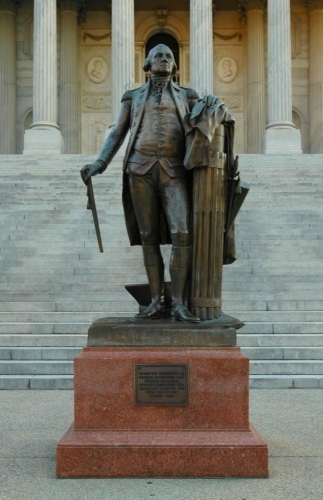 Washington’s statue, is not whole as it turns out. His cane is broken. The question is: why would the cane of one of the beloved founding fathers be so ruthlessly shattered? This, according to the members of the SHPG, is not a case of random vandalism but apart of brutal Yankee assaults that ravaged South Carolina. It appears that during the North’s occupation of South Carolina in 1865, several of the soldiers took to gathering souvenirs, destroying property and things like breaking canes. But is that the only explanation? Now it’s pretty simple, and reasonable, to assume that the Northern soldiers did in fact break off a piece of that cane. Vandalism is not purely a “Yankee” phenomenon but an international one. Northern soldiers are subject to the faults of humanity just as anyone else is. Even the plaque at the base of the statue reinforces the notion that the Northern troops were the guilty ones. So though it seems reasonable, and even reinforced, why would there be an assumption of a mystery? Call it intuition, call it curiosity or maybe just the dumb luck of coming across an interesting story ( I was bored and Googled it) I found that there is an alternative explanation of how ol’ George’s cane broke. According to the South Carolina State House website, Washington’s cane met its demise in a ill-handled relocation. This alternative explanation makes sense as well. I’ve been to Lexington and heard the story about Northern troops refusing to burn Washington College because General Washington’s statue sat atop the roof. That demonstrates Union soldiers’ kind heart for relics glorifying the founders. I’ve also heard local legends in my hometown, Ringgold, GA, about how the court house met its demise at the hands of Sherman. Then I found out lightning struck the courthouse in the 1890’s. I’ve also heard that Sherman was going to torch the old courthouse until he found out that the Mason’s lodge was on the top floor. 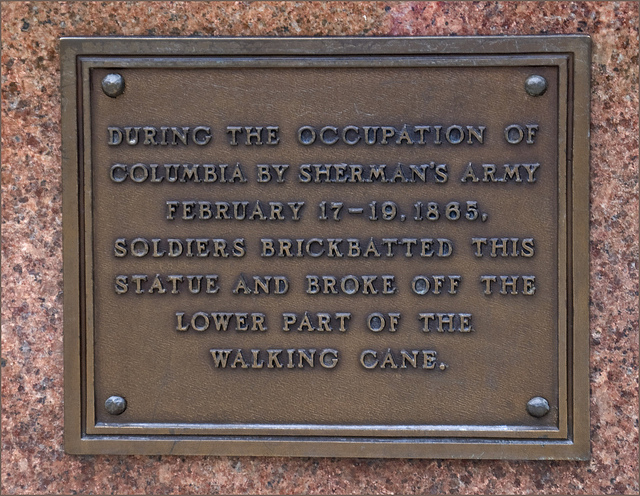 Sherman being a mason himself, spared the courthouse. Even that story doesn’t make sense to me because nothing else in the town was targeted or burned. I say this to demonstrate that in some cases, unrelated events have been chalked up to Sherman “atrocities.” So do we a have a situation of memory conflicting with truth? Well, that’s what I am hoping to find out. I didn’t post this simply to poke fun at the SHPG or any thing such as that. I find it curious that the South Carolina State House has an alternate reason for the broken statue than the statue’s own plaque has. With that curiosity comes a desire to know the truth. So if any of you out there know more about the State House statue, share it with the world in the comments section below. Thanks. I was skeptical about the story provided because I knew the State House was not completed in 1865 and that particular building serves as both a government building and a monument to Yankee “atrocities. To be clear, that skepticism is not narrowed or specific towards the SHPG. I am fairly skeptical about most statements. But I would like to know what really happened. It’s an interesting “micro” story perfect for a hometown newspaper. There’s a great desire among some folks to exaggerate the actions of Sherman’s army in the South. On another discussion board we recently talked about a case in NC where Sherman’s army supposedly wantonly burned the local crossroads church out of spite. It’s been part of local lore for a long time, and has even worked its way into several secondary accounts of the community’s history in the last 20 years, so anyone wanting to know more would find multiple secondary sources attesting to it. As it turns out, the actual event transpired somewhat differently, according to legal documents filed by the church congregation itself. The army pulled down the church building for materials to repair a causeway needed to move the army. Two church outbuildings were also torn down for use as firewood by the army. None of them were simply torched out of spire, as the story claims. Further, the army didn’t damage the local residences nearby. The passing soldiers apparently gave the church leaders a receipt for the materials they’d seized, which was never paid. The church eventually filed a claim many years later, under new legislation allowing for such claims, in which they told the whole story. I believe they were eventually reimbursed, although obviously by then that was more a symbolic victory than a practical one. My point is not that the locals shouldn’t have a beef against Sherman’s army, or that it was no big deal — for those locals, I’m certain it was. But what actually happened is quite different in tone and substance from what everyone now “knows” to be the “truth” about that monster Sherman who spitefully burned their church for no reason. Some people have a need to be victims, even if they have to make up an offense to do it. Great story. There is a similar story for the Church my grandparents go to. The church still has the receipt from the military’s use of the building. I received this comment at the old URL.